Panasonic and other makers of high-definition TVs are looking to faux 3D technology to provide stereoscopic depth--and a reason for consumers to buy a newer set. Disconnecting your active-shutter 3D glasses from a charger, you slip them on, eager to check out your downloaded copy of Hulk VI: Triumph of the Stretch Fabrics, the latest entrant in the green antihero's film franchise. You drop into a comfy chair, tell the kids it's time for a movie, and twist the heat pouch on a bag of popcorn to start it popping. The kids grab their own glasses and sit down to watch the Hulk knock the Predator practically into their laps! When television makers introduced HDTVs, it was inevitable that they would figure out a way to render the technology obsolete not long after everyone bought a set. And they have. The next wave in home viewing is 3DTV--a 2D picture with some stereoscopic depth. As 3D filmmaking and film projection technology have improved, Hollywood has begun building a (still small) library of depth-enhanced movies. The potential to synthesize 2D movies into 3D could feed demand, however--the way colorizing technology increased interest in black-and-white films in some circles in the 1980s. For movies based on computer animation--such as Toy Story 3D, a newly rendered version of the first two movies in the series--it's already happening. The promise of 3D is a more immersive, more true-to-life experience, and substantively different from almost anything you've watched before. In commercial theaters, 3D projection typically involves superimposing polarized or distinctly colored images on each frame and then having viewers wear so-called "passive" glasses that reveal different images to each eye. The brain synthesizes the two images into a generally convincing notion of depth. In contrast, 3D at home will almost certainly rely on alternating left and right views for successive frames. HDTVs that operate at 120Hz (that is, 120 cycles of refresh per second) are broadly available, so the ability to alternate left and right eye images far faster than the human eye can follow already exists. Fundamental industry standards are in place to allow such recording, says Alfred Poor, an analyst with GigaOm and the author of the Web site HDTV Almanac. Viewing 3DTV displays will require "active" glasses that use rapidly firing shutters to alternate the view into each eye. Active glasses are expensive today, but their price will drop as 3D rolls out. Meanwhile, designers are in the development phase of producing a 3D set that doesn't require the glasses. Sony and Panasonic have announced plans to produce 3D-capable displays, and Panasonic recently demonstrated a large-screen version that the company expects to ship in 2010. As happened when HDTVs rolled out, premium 3DTVs will appear first, followed by progressively more-affordable models. Creating and distributing enough 3D content to feed consumers' interest may be more of an challenge. Poor noted that filmmakers are currently making or adapting only a handful of features each year for 3D. But techniques to create "synthetic 3D" versions of existing films (using various tracking, focus, and pattern cues for splitting images) could fill the gap. Existing terrestrial cable and IPTV networks should be able to distribute 3D content. The bandwidth that such networks use to deliver typical HD broadcasts will be adequate for delivering 3D video once the networks upgrade to newer video compression techniques. Satellite may face a more difficult road, since such systems already use the best levels of compression. For physical media playback, Blu-ray can store the data needed, and 3D Blu-ray players are already on the drawing board. No fundamental changes in Blu-ray will be necessary, so the trade group that created the standard is focusing compatibility--such as ensuring that a 2D TV can play a 3D disc. Standards issues might not end up being very troublesome, so long as the 3DTVs are flexible enough. An industry group is working on setting some general parameters, much as digital TV was broken up into 480, 720, and 1080 formats, along with progressive and interlaced versions. 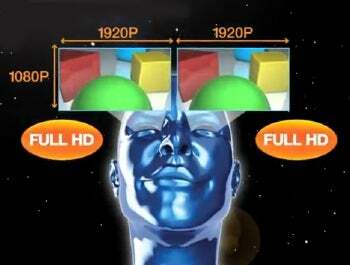 A 3DTV may need to support multiple formats, but all will involve alternating images and a pair of shutter-based glasses. Poor expects that 3DTV will be but a minor upgrade to existing HDTV sets. The upgraded sets will need a modified display controller that alternates images 60 per second for each eye, as well as an infrared or wireless transmitter to send synchronization information to the 3D glasses.